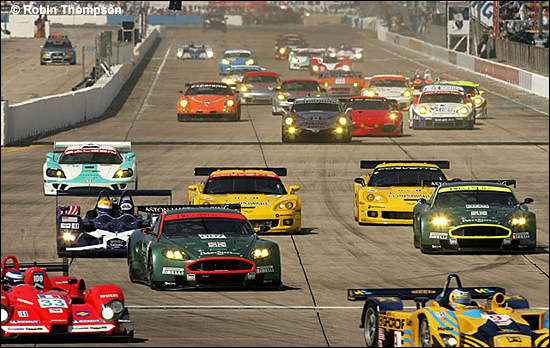 “We are pleased to confirm our attendance of the next two American Le Mans Series races,” said James Turner, Commercial Director of Aston Martin Racing. That’s a reference to the already announced, two-car entry at Houston and Mid-Ohio. “The next two races will be interesting as we have never been to either venue before," comments Technical Director George Howard-Chappell. "The street course at Houston will present its own challenges for the team. “We have been working hard with our partner Pirelli to develop the tyres and the set up and IMSA has done an excellent job in equalising performance within the GT1 class," continues GHC. "The two DBR9s have been given a performance break and will run 25kg lighter than at Sebring which should result in really close racing between Aston Martin Racing and our competitors." This confirms that the two DBR9s ran at 1125 kg and 31.2mm restrictors at Sebring (they could have run at 1175 and 31.8) - but from Houston, they'll be at 1100 kg with 31.8 mm restrictors. In car 007 (red highlights), Tomas Enge will be joined by Darren Turner, while Pedro Lamy and Stephane Sarrazin will drive 009 (yellow highlights).